Every land has its makers. Crafters of furniture. Forgers of steel. Tillers of earth. Ours are masters of making wine, beer and spirits. More and more of these makers are putting down stakes near our Lake Michigan shore where they handcraft award-winning beverages. You’re just minutes from each one in Southwest Michigan. Just follow the Makers Trail. 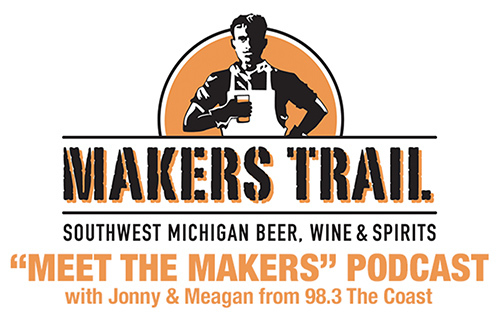 What a welcome you’ll receive at each stop along the way in Berrien County as we pop wine corks, tap beer kegs and whiskey barrels, and pour flights for you and your friends. Drink in our makers’ art and bring home your favorites. Along the trail, enjoy your choices with pairings of savory cheeses, smoky grilled meats, crisp vegetables and hand-dipped, creamy chocolates. Most of our maker's foods are made with locally sourced ingredients. Pause for a moment in the whirl of life. These are the makers of happiness. When is the best time to travel the Makers Trail? Spring, summer, fall and winter! Each of our makers has his or her own unique gathering places to taste their craft. Many throw crazy-fun festivals at their sites or on the beach. Others have spaces to celebrate your weddings and special events. You’ll find makers along the Trail who offer delicious full menus for lunch and dinner. Some give food pairing, yoga or art classes, show films, discuss books or invite artists and music makers to share their talents, too. And yes, there are also dog-friendly stops. All have makers and staff that are passionate about their craft and like nothing better than to answer your questions, share their stories and make recommendations of what to try next. Laugh and enjoy life with us!